It's coffee o' clock here at Cute and Mundane. 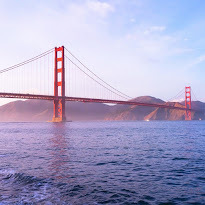 I'm enjoying the last beautiful moments of my week-long vacation today and am gearing up for what's likely to be the toughest quarter of the year. (I can already feel the anxiety settling in). 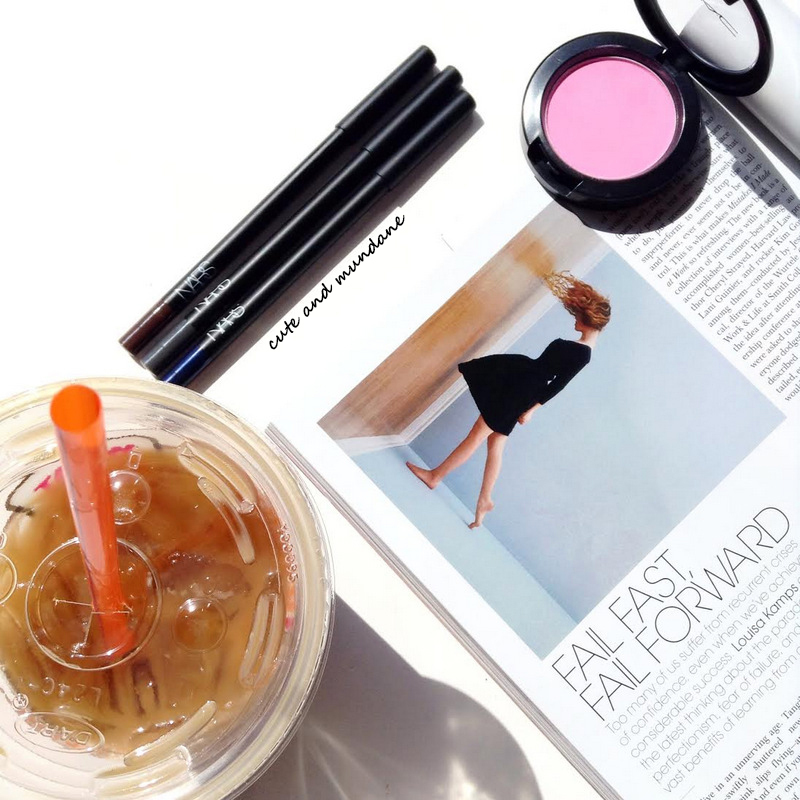 Fortunately, my week off coincided with the April issue releases of some of my favorite glossies; I read a fantastic article in Elle titled Fail Fast, Fail Forward. The themes of perfectionism, fear of failure, and learning to learn from mistakes really resonated with me, as I'm sure they do with many others out there. I highly recommend the article, if it's a topic that piques your interest! With that said, let's get back to blush! 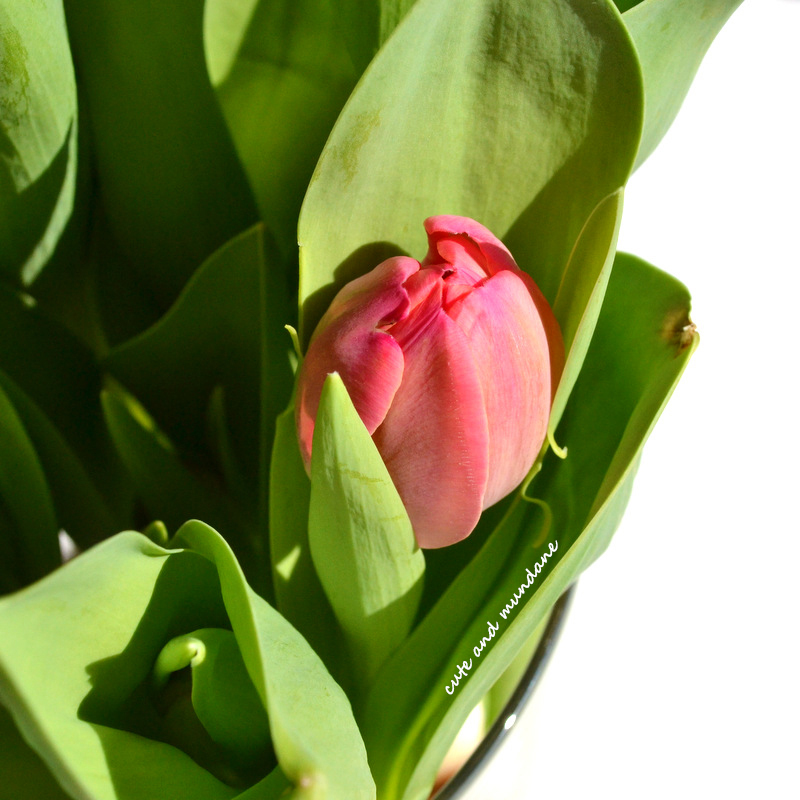 I thought this sunny Sunday would be the perfect time to feature a pretty pop of pink. 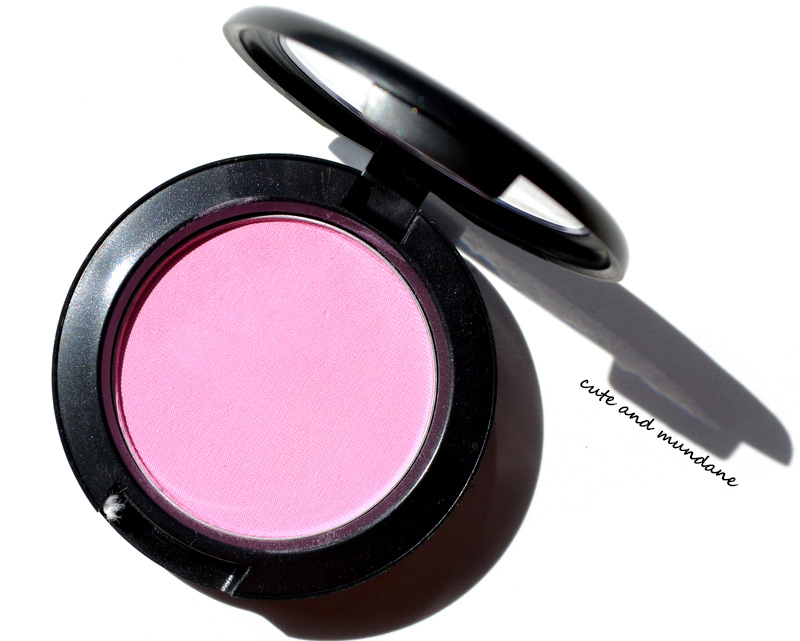 MAC Peony Petal is a re-release in the MAC Tres Cheek Collection (Summer 2014). 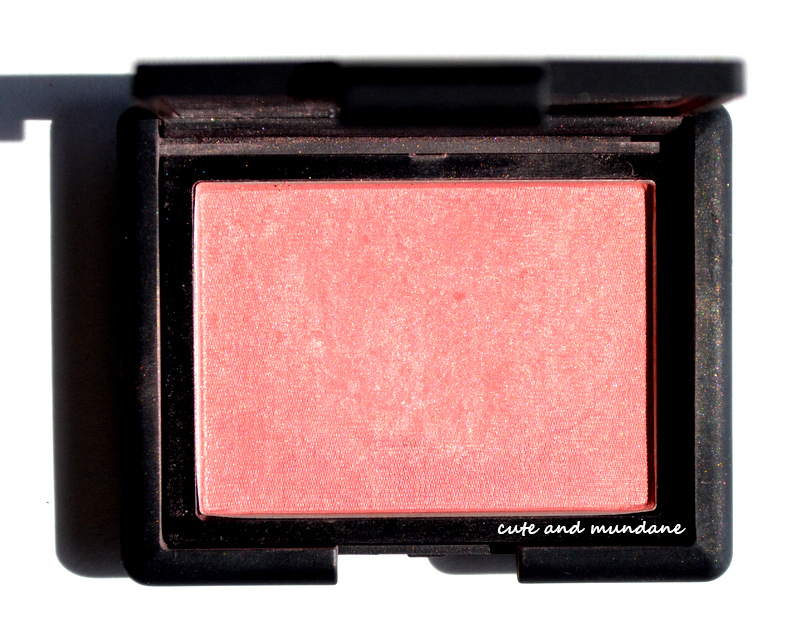 I've had this blush in my collection since its first debut; it's a gorgeous shade, so I'm glad it's being featured again! 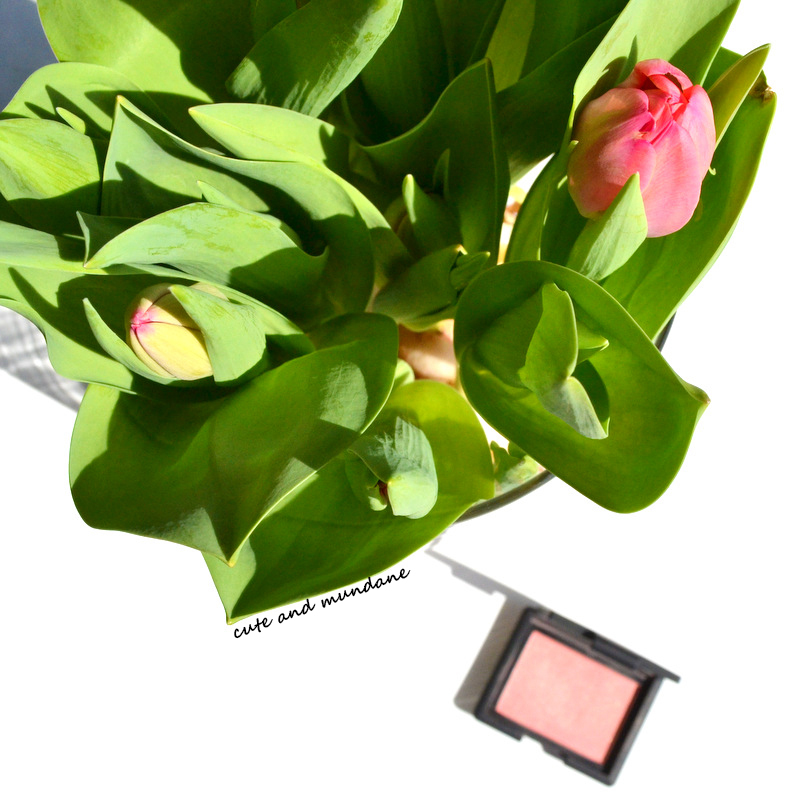 MAC Peony Petal is a bright blue-pink blush with a satin finish. It adds a wonderful brightness to cheeks! 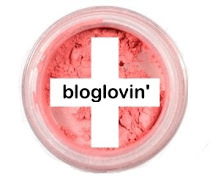 If my skin was a little less sensitive to MAC blushes, this color would be a staple shade for me. 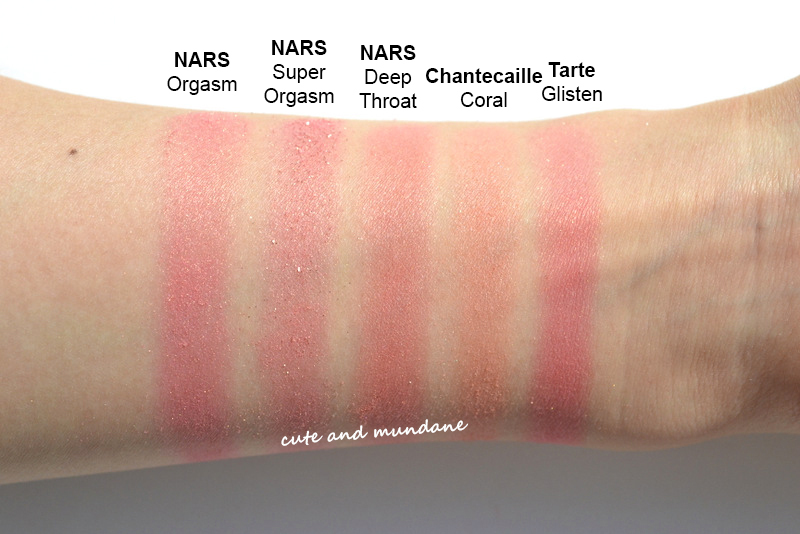 As you can see from my comparison swatches below, MAC Peony Petal is quite light and cool toned! 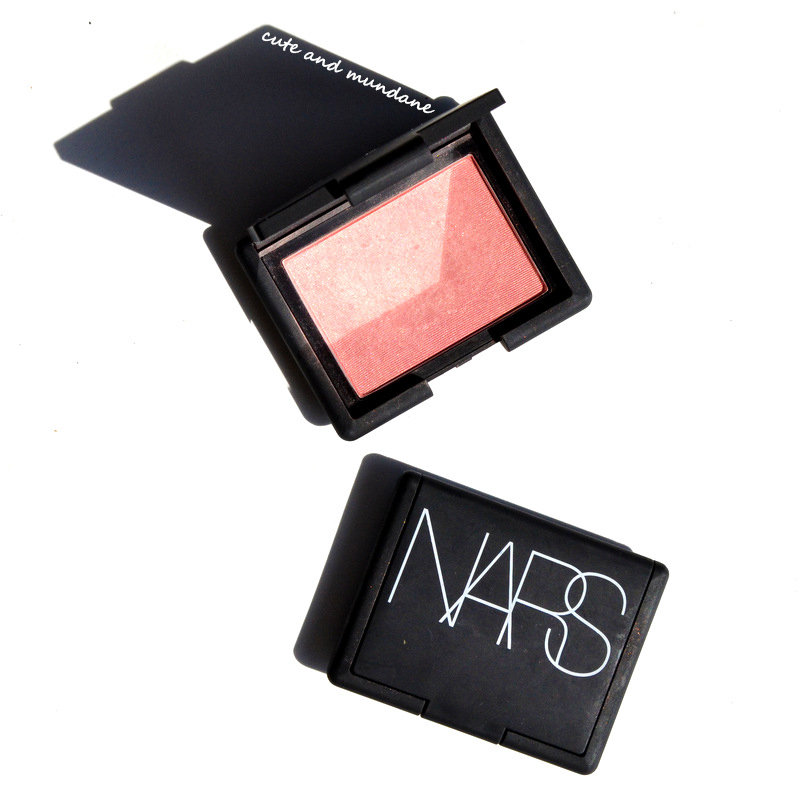 NARS Angelika is warmer and has sparkles (surprising to me, as I've always thought Angelika was quite cool itself). 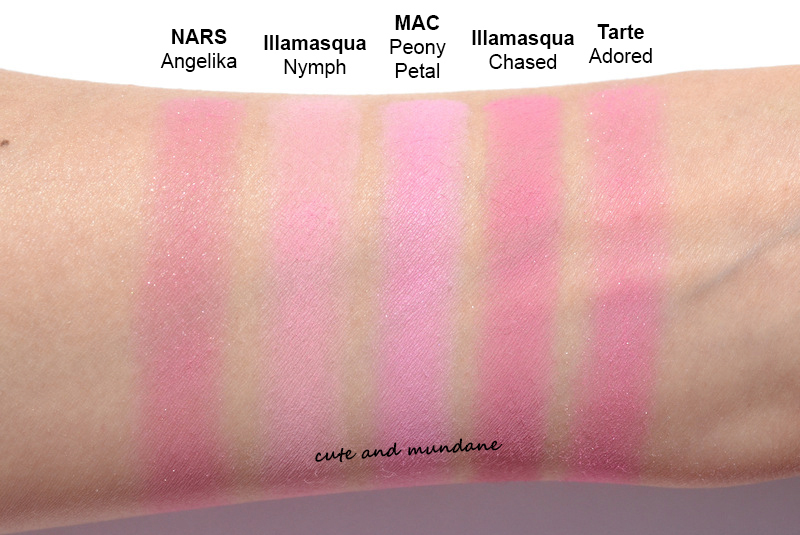 Illamasqua Nymph, a bubblegum pink, is the most similar of the set, however it's a little lighter and less blue toned. Illamasqua Chased, a purple tinged pink, is darker and warmer. Tarte Adored (click for review) is a a warmer pink with sparkles. I'm quite fond of the cooler spectrum when it comes to pinks --- so I enjoy having the gorgeous blue-pink of MAC Peony Petal in my collection! (It's also worth mentioning that I'm fond of anything peony-related, thanks to growing up with plenty of the pink blooms in mom's garden!) I'm glad the shade is being featured again in the MAC Tres Cheek collection; it's an opportunity to pick up a pan if the pink piques your interest, plus it's a chance for me to give mine another swirl! Thanks for reading! 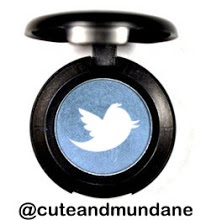 What shades from the MAC Tres Cheek collection caught your eye? What is the coolest pink in your collection? How have you been, and what magazine articles have you enjoyed lately? Color me excited about the TATCHA Indigo collection! This collision between color and complexion is all about indigo, a plant prized in Eastern Medicine for its anti-inflammatory benefits. It's a welcome concept for those with atopic skin, like myself. I've been luxuriating with my own set of the Tatcha Indigo collection courtesy of Tatcha, and have my review to share with you today! I've featured Tatcha here previously, however to recap, the luxury line combines traditional Asian beauty with modern technology to create an inspired skincare routine. The three pieces I have to share with you today are the TATCHA Indigo Soothing Silk Hand Cream, TATCHA Indigo Soothing Silk Body Butter, and TATCHA Indigo Soothing Renewal Treatment. Aesthetics are an important part of the TATCHA Indigo experience, as you can see from the pieces here! The lightly iridescent indigo and gold containers are housed within dark wood print boxes, inside which you'll find decorative paper drawers. All of the products have a lovely spa-like scent reminiscent of sweet rice and camellia. It's the same scent found in the rest of Tatcha's line, though I noticed the lightest touch of an extra plant-like scent as well (which I assume is from the indigo extract). 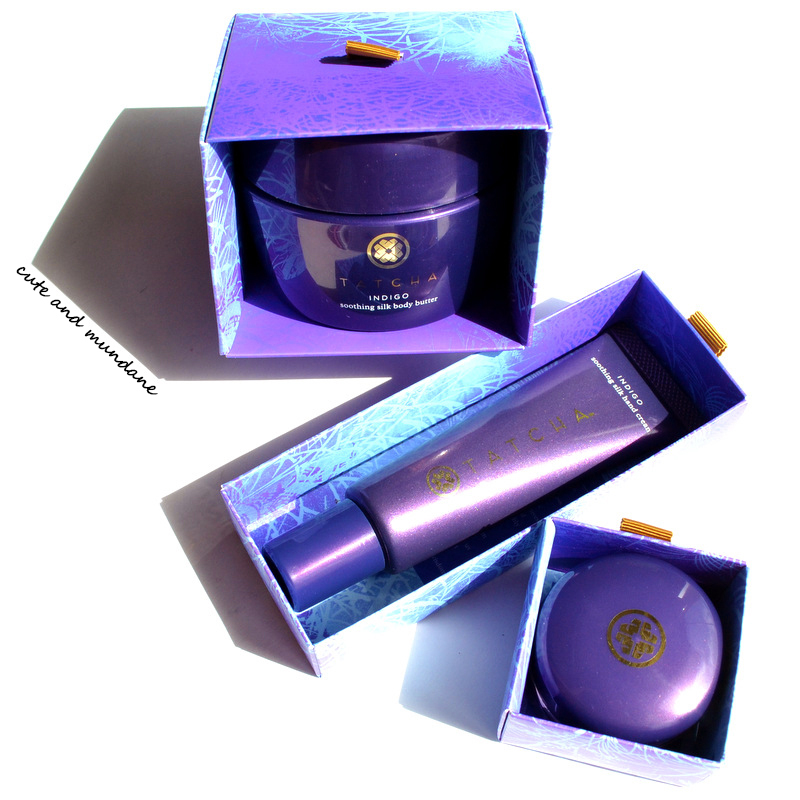 TATCHA Indigo Soothing Silk Hand Cream ($38 for 2 fl. oz.) is housed in a convenient squeeze tube. The design makes it easy to expel just the right amount (and you don't need much). The formula sinks in quickly and leaves just a light residue, which I find to be common to Tatcha product formulations in general. It strikes a really nice balance as hand creams go; it's moderately hydrating without being too evanescent. As someone who constantly washes her hands on the job, it's so nice to have on hand! TATCHA Indigo Soothing Silk Body Butter ($48 for 6.7 fl. oz.) is a moisturizing treatment for the body. (It's a wonderful idea, after all why should our complexions get all the pampering?) The one thing I do have to say however, is that the name is mildly misleading. The texture is quite light and almost whipped, not oily or buttery. That said, like a butter, a little does go a long way. 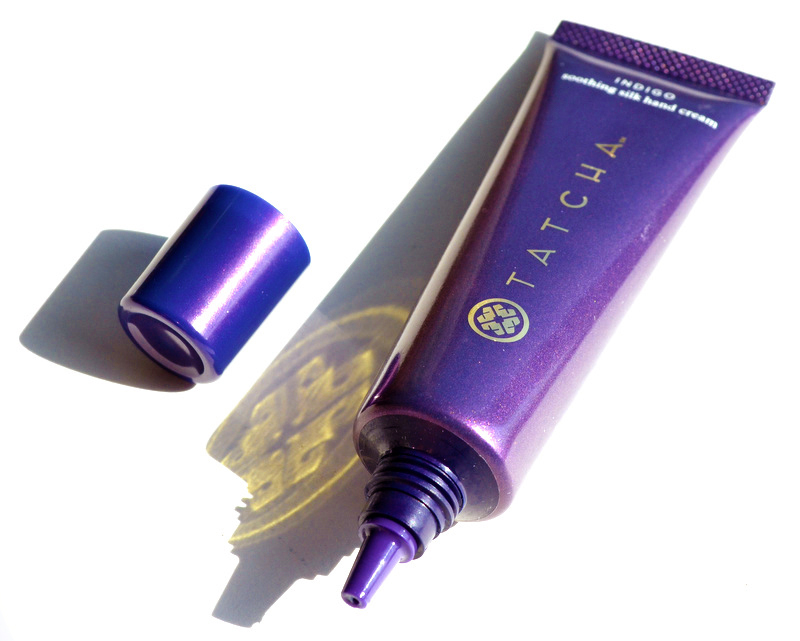 Like the hand cream, it sinks in quickly and leaves a light protective residue, as is typical of Tatcha products. Before I conclude, I should answer the question you may be most curious about! 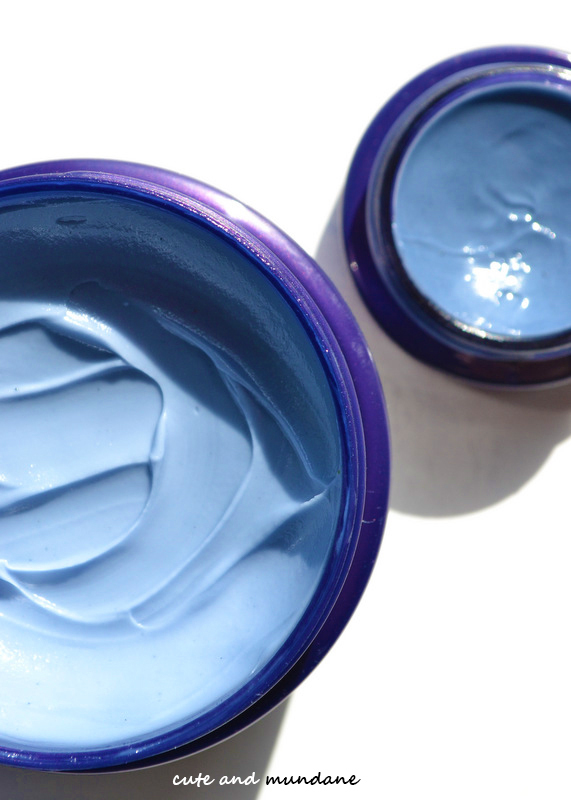 Does the Tatcha Indigo collection turn your skin blue? Yes, and no. Initially, you notice the slightest indigo tint as you smooth it on. However, it blends in and dissipates over time.... I have yet to turn into Smurfette despite covering myself in Tatcha Indigo from head to toe! 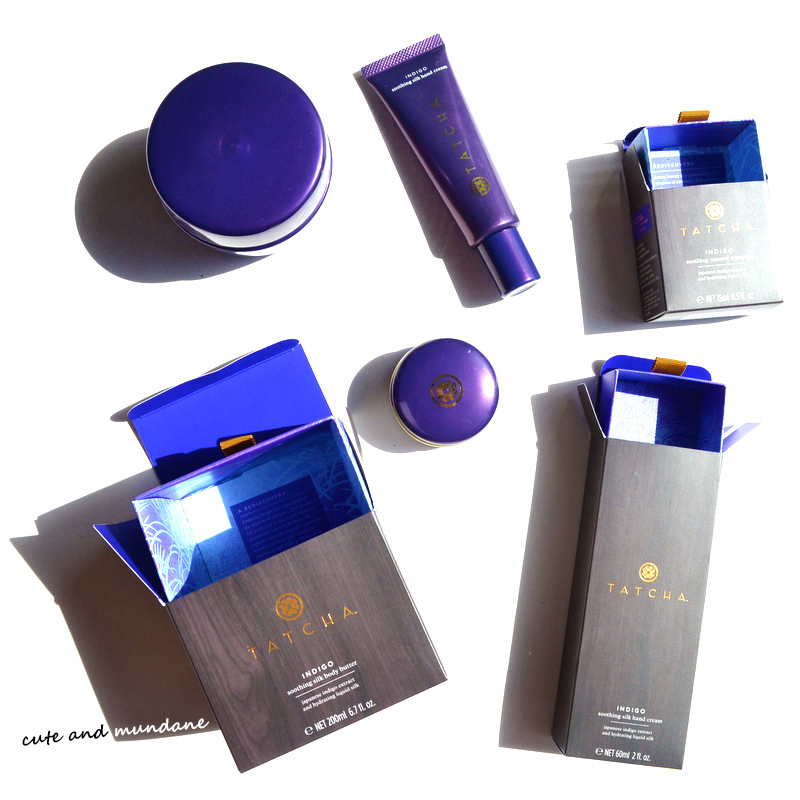 Overall, I'm delighted to have the TATCHA Indigo collection as a part of my skincare routine! As someone with sensitive skin, this is my favorite set of theirs to date. 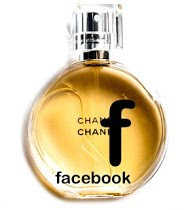 I adore the spa-like scent and am kind of tickled by the smurf-blue pigmentation as well. I'm hard pressed to recommend just one item; I'd say it depends on what you're looking for! I find the face serum to be most indulgent, the hand cream to be most practical, and the body cream to provide a wonderful whole-body experience. Thanks for reading! Have you tried Tatcha? What products would you recommend? And of course, what do you think of Tatcha Indigo's blue hue? P.S. To learn more about Tatcha's skincare philosophy and shop the new TATCHA Indigo Collection, be sure to visit www.Tatcha.com! P.S.S. For more on Tatcha Indigo and founder Victoria Tsai, check out her interview on WSJ! For more reading, I've linked my reviews of Tatcha Ageless collection, Tatcha Aburatorigami, and Tatcha's classic skincare routine, as well. Disclosure: This post contains product(s) sent to Cute and Mundane for consideration. The ideas and opinions in this post are genuine and my own. There are no affiliate links in this post, as usual. Happy Friday! I can't tell you how good it feels to be clacking away on my keyboard with a new post for Cute and Mundane! 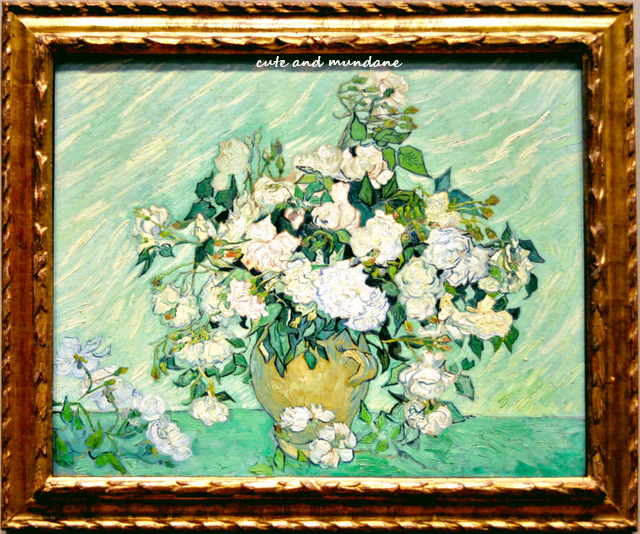 It's been a crazy quarter for me --- twelve (or more) hour workdays and six day workweeks do tend to wear on you after a while... and add a new perspective on life's little essentials, beauty and otherwise. With that in mind, I'm sharing my Friday Five list of staples that were worthwhile, despite a 5am start! Given the circumstances, I got my hands on the largest set of Starbucks K-cups I could find (hello Costco!). I like to fix my coffee at home, for the sake of efficiency as well as my idiosyncrasies. I like mine with coconut milk (dairy and soy are on my ingredient sensitivity list), as well as a generous helping of organic cane sugar! Perrier has become my signature drink, of sorts. You'll rarely see me without one! Staying hydrated was one of my new year's resolutions, however during a busy workday, it can be difficult to remember to sit down and drink a glass. With a lovely green bottle of fizz to look forward to, it's easier to do. Thirty seconds of snapshot surfing can do wonders. I've really come to enjoy Instagram as a way to get a quick beauty fix. I'll admit it's nice to live vicariously through others while my personal routine is on autopilot for the time being! 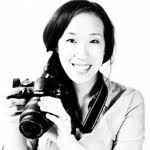 A few of my favorite beauty bloggers on Instagram are Beauty Look Book, Makeup Magpie, Amyppl, Lenallure, and KarenMBB. You can of course find Cute and Mundane there as well! Previously, I was all fingers when it came to foundation application. I've since become a Beauty Blender devotee! It's fast, adds a smooth finish, and doesn't require scrubbing all the extra residue off one's tips afterwards. In terms of product, I'm still loving CHANEL Perfection Lumière for it's long lasting finish. ... are not to be underestimated! Typically I use a touch of wax as well as tweezers throughout the week. However these past few months I fell behind a bit (in addition to being thwarted by a broken microwave) . The result wasn't terrible, as my brows are relatively fine, like my hair. However, I've realized that it's well worth putting extra time into my arches --- I just feel (and look) more alert. Thanks so much for reading! I'm so glad you took the time to stop by! 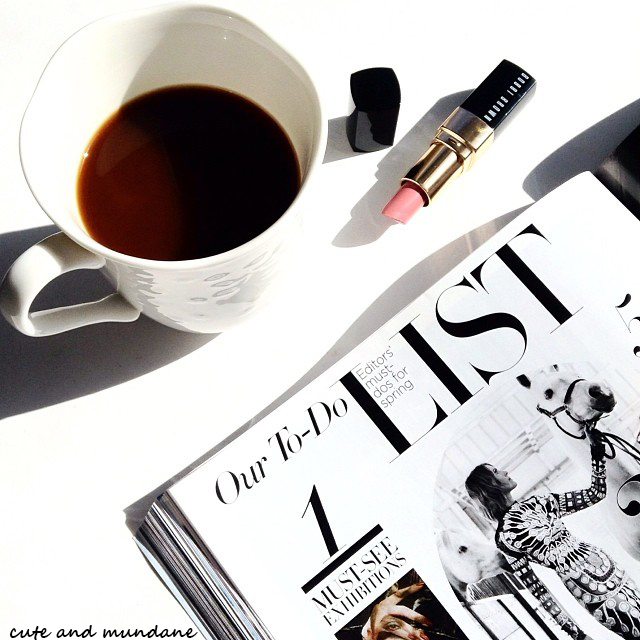 I'd love to know --- what are your busybody beauty staples? What are the non-negotiable parts of your beauty routine?